German Chancellor Angela Merkel said Tuesday she is prepared to make “painful compromises” in a final round of talks to seal a coalition deal for her fourth term and end months of political limbo in Europe’s top economy. As negotiators from Merkel’s CDU party, her Bavarian CSU ally and the Social Democratic Party (SPD) gathered for one last push to clinch an agreement on a renewed “grand coalition”, Merkel said it was time to end the political uncertainty. “We live in turbulent times,” she said, pointing to heavy losses in recent days on global stock markets. Merkel said all sides would “still need to make painful compromises” to get a deal. “I am ready to if we can ensure that the advantages outweigh the disadvantages in the end,” she said. Despite the protracted haggling — the talks were initially supposed to end at the weekend — the parties sounded upbeat on meeting Tuesday’s self-imposed deadline. SPD chief Martin Schulz said there was “good reason to believe that we’ll reach the end today”. “I think that today will be the decisive day as to whether the three parties — CDU, CSU and SPD — will finish a joint coalition agreement on whose basis a stable government for Germany can be built,” he said. However CDU vice president Volker Bouffier warned that the agreement was not yet certain. “Nothing is guaranteed,” he said. Party sources said the main sticking points were disagreements over healthcare, labour policy and defence spending. Merkel, in power for over 12 years, has pinned her hopes on a repeat alliance with the SPD after September’s inconclusive election left her without a ruling majority. But commentators have already dubbed the tie-up a “coalition of losers” after both parties slumped to their worst results in decades in the polls, while the far-right Alternative for Germany (AfD) took nearly 13 percent of the vote. 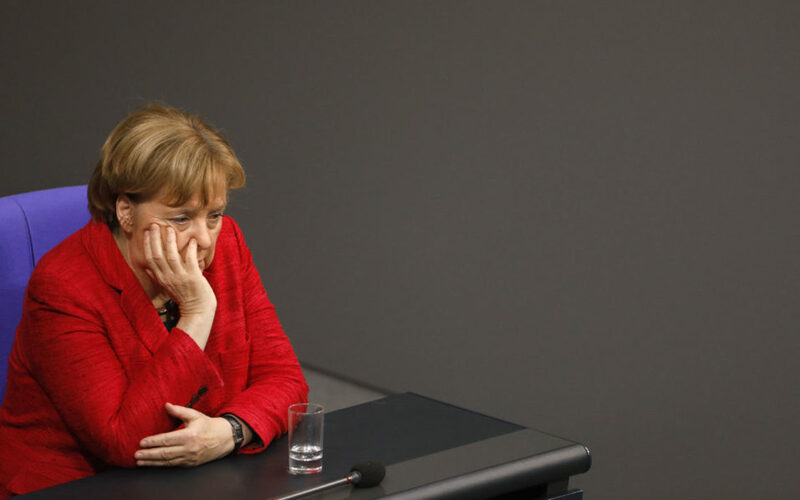 Faced with the option of a snap election that could further boost the AfD or the prospect of heading an unstable minority government, Merkel opted to woo back the SPD — her junior partner for two of her three terms since 2005. Even if both sides end up signing a coalition agreement that lays out the next government’s policies, a new Merkel-led government is not yet guaranteed. Schulz has promised to put any coalition accord to a yes-or-no referendum by the SPD’s 440,000 rank-and-file members. Observers expect the vote to be tight, with the SPD’s left and youth wings fiercely opposed and still fuming over Schulz’s decision to consider another Merkel alliance despite initially vowing to take the party into opposition. The SPD referendum result is expected in early March. If all goes well for Merkel, a new government could be in place by the end of next month. Although Merkel is often described as Europe’s most powerful woman, her struggles to form a government have harmed her political standing at home and abroad. Germany’s European partners in particular are eager for an end to the gridlock in Berlin that has held up decision-making just as French President Emmanuel Macron is pushing for major EU reforms. While Merkel and the SPD are open to the French plans for deeper eurozone integration, the SPD is more enthusiastic about some of Macron’s more ambitious proposals such as a joint eurozone budget and finance minister. Schulz said Monday the would-be coalition partners had successfully finished the European chapter of their talks. While details remain vague, the former European Parliament chief said they had agreed to support a eurozone investment budget and end “the austerity diktat”. But they are still at loggerheads about the SPD’s demands to limit short-term work contracts and overhaul Germany’s two-tier healthcare system. They are also at odds on boosting defence spending, party sources told DPA news agency. While Merkel’s conservatives want to increase spending to bring it closer to NATO targets, as demanded by US President Donald Trump, the SPD is sceptical. Merkel said Tuesday that Germany’s “international dependability” was at stake in the negotiations. A new poll for Bild newspaper found that the lengthy wrangling has hurt both main parties. Support for the CDU/CSU fell from 33 to 30.5 percent, while the SPD slipped from September’s historic low of 20.5 percent to 17 percent — leaving the coalition hopefuls without a combined majority. The AfD meanwhile scored a record 15 percent.